, originally uploaded by framboise. Finlaggan went for his very first bicycle ride* today! We went around the nice and flat sky wall around Stanley Park in the mist. He enjoyed watching the fellow cyclists, pedestrians, quacking ducks and honking container ships. 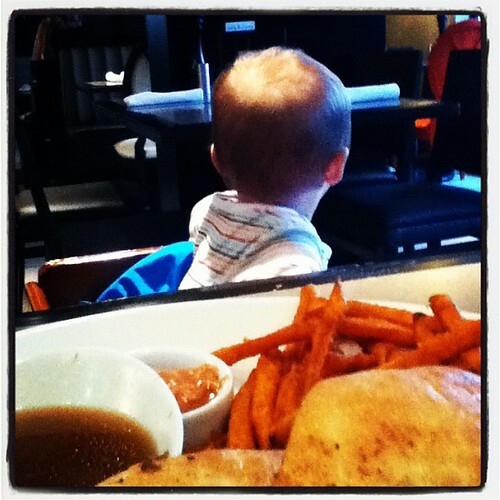 He also made some friends at Milestones in English Bay where his greedy parents enjoyed a prime rib au jus sandwich (foreground). And the jus of the title is the inevitable snottery leakage from the cold bébé’s nose, mixed with the drizzle that he bravely sat through to satisfy his parents’ desire to get his new rain gear properly wet and feel justified in having bought a rain suit for a baby who lives in dry, sunny LA. *Photographic evidence to follow when the Eye-Fi can be convinced to talk to the travelling laptop. 15 April 2012 update: Photos of Fin biking and of our little tour of Stanley Park in the rain on Flickr, and more Fin on a bike here. This entry was posted in akatsuki snaps, akatsuki travels and tagged baby mushroom, mushroom, vancouver, winterpaganfestival. Bookmark the permalink.